By the end of 2015 the 10 ASEAN Member States (AMS) establish a common area for their economies, social development, and security. ASEAN integration involves free exchange of goods, services, investments, capital and, with some restrictions, qualified workers between the states. These regional developments have far-reaching consequences for efforts to reform vocational education in individual countries. Strategies and policies for vocational education and training have been developed mainly on national level, but the various training systems are not yet oriented to a regionally integrated job market. The scope and quality of educational offers from national vocational training institutions have not yet been adapted to the new requirements. Competent managers, vocational teachers and instructors are particularly lacking. The programme objective is to support and create personnel, institutional and thematic preconditions for quality improvement and regional harmonisation of the education and training of Technical Vocational Education and Training (TVET) personnel in South East Asia. RECOTVET will facilitate regional cooperation with a number of result-oriented activities, which intend to intensify the effectiveness of vocational education and training in all ASEAN countries. Efforts will be made at the political, institutional and individual level in order to have an efficient impact chain. For this reason, RECOTVET is active in three different action areas that reinforce each other and are closely interlinked. The first action area of RECOTVET lays the foundation for future cooperation by organisingRegional Policy Dialogues. Key regional and national TVET stakeholders including the private sector from South East Asia are brought together to jointly discuss the challenges and opportunities of quality improvement and harmonisation of TVET personnel on the regional, national and intra-regional level. The Regional Policy Dialogues find a practical translation in three thematic Working Groups, whose work mode is highly output-oriented and will forge applicable reform proposals for each of the specifically assigned topics. With the second action area, RECOTVET responds to the demand for human capacity development across South East Asia by offering trainings to key multipliers on how to design, implement and evaluate vocational training programmes tailored to the needs of the labour market. Workshops, trainings and field visits are planned to improve competencies of a) Multipliers and executive experts from responsible ministries; b) TVET teacher trainers and trainers for TVET management training; c) teaching personnel from academia (RCP network). The third action area involves the established collaboration among universities and TVET teacher education institutions in providing studies that support a better development of vocational personnel’s qualification. Political reform proposals that work in practice cannot lack the background of a solid research and data analysis. Studies and results will be presented at Regional Policy Dialogues. The Regional Cooperation Platform for Vocational Teacher Education and Training in Asia (RCP) represents a network where members adapt TVET teacher education and training programmes to new conditions of the socio-economic environment in ASEAN. This includes intensified linkages with industries as well as reflecting transversal and 21st century skills in TVET curricula. Two Regional Policy Dialogues organised in 2015 in cooperation with ASEAN and the OECD as well as political partners in Viet Nam and Cambodia, giving key stakeholders the opportunities to jointly discuss challenges and solutions in TVET from a regional angle. Three thematic Working Groups established with members coming from all AMS and regional organizations. Thematic focuses include 1) Development of regional core standards for TVET personnel; 2) Policy recommendation for a quality assurance system for TVET and 3) Identification of regional and national good practices for TVET personnel qualifications. 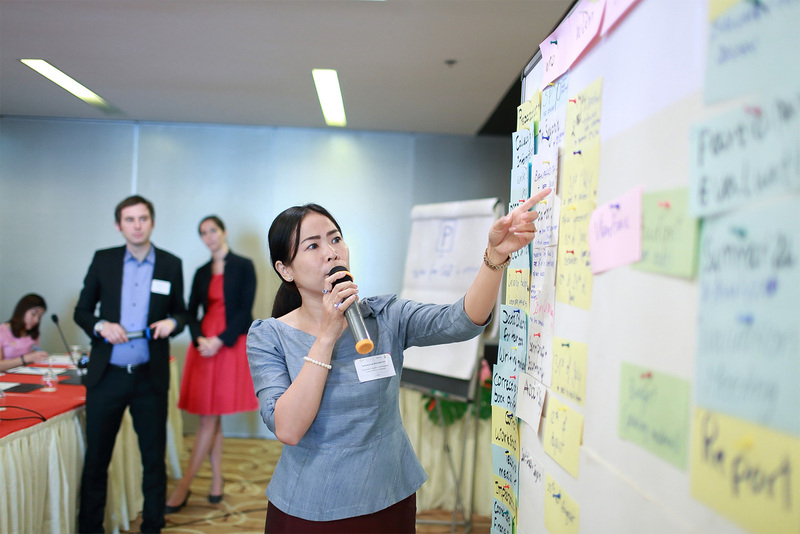 67 Multipliers from Cambodia, Laos, Myanmar and Vietnam (CLMV) countries as well as Indonesia trained in a series of trainings to foster change on the organisational and systemic level. Implementation of the newly gained competencies of the multipliers will be secured by transfer projects which are specifically designed towards the participant’s working context. Support will be given by bilateral GIZ TVET projects in the respective countries. Four research projects chosen for RCP’s call for proposals covering topics of 1) research and implementation of Public-Private Partnerships (PPP) between universities, government and private companies on TVET in ASEAN (+3); 2) development of regional core standards for TVET personnel in ASEAN; and 3) approaches to secure implementation of inclusion in TVET systems in the region.